Maui is Hawaii’s renowned resort destination and a popular vacation spot for many tourists. We couldn’t think of a better place to start our Hawaii island hopping adventure and recover from our jetlag. But did you know there are plenty of things to do in Maui with kids other than lounging by the pool? The best thing is that many of these family activities in Maui can be combined since they aren’t too far apart. Check out the map we’ve created indicating all the Maui for kids experiences mentioned in this post, you’ll find it in one of the last paragraphs. If you’re looking for spectacular scenery, then this place should be on your list: ‘Iao valley State Monument. The famous Kuka’emoku or ‘Iao Needle rises 1200 feet from the valley floor or 2250 feet from sea level. The Needle is the result of millennia of erosion by the streams and waterfalls and is also known as the phallic stone of Kanaloa, the god of the ocean. 🙂 The valley itself is a sacred place. The scenic viewpoint is within easy reach from the parking lot and has a steep paved path and 133 steps leading to the observation deck, making it suited for all ages. You’ll first find a small botanical garden with plants brought to Hawaii by the early Polynesians and cultivated here long ago by the Hawaiians. There’s also a small pool below the bridge where local daredevils try to catch your attention. A visit to the ‘Iao Valley State Monument is one of our favorite things to do in Maui with kids because it offers such a dramatic change of scenery and requires very little effort. While our personal experience with the Road to Hana was far from idyllic to say the least, Twin Falls is one of the first Road to Hana stops and thus one of the most doable ones for families with (young) kids. Twin Falls might not have the most impressive waterfall but it might be enough for kids to enjoy. We only made a quick stop and saw a glimpse of the lower since it was pouring rain that day. The hike in the surrounding Ho’olawa Valley and up to the upper Caveman Falls is about 1.2 miles on a gravel road. It’s not very well sign-posted but we found the explanation on this website pretty thorough. Otherwise, we’d suggest taking this tour by Hike Maui. The area is sensitive to flash floods so check the latest conditions before taking the trip. Also, parking is limited. Especially in the morning, when the Road to Hana day trippers start their adventure, it is packed. So you might be better off planning this hike around noon or early afternoon. Very different from the lush, green scenery in the previous hikes is this accessible coastal hike, the Kapalua Coastal Trail. There’s a convenient parking lot in Kapalua Bay, next to the Napili Kai beach resort. The trail will lead you all the way to DT Fleming beach, a distance of just under 2 miles (about 3,5 km) and mostly flat. Plan your hike in the early morning or late afternoon to avoid the heat. Looking for some more challenging trails? Then check out our dedicated Maui hikes article for some spectacular additions. Make your Maui family vacation extra memorable for the kids by teaching them how to snorkel. It’s an experience they’ll never forget. There are plenty of family-friendly snorkeling spots on the island, making Maui an excellent choice for first-time snorkelers. We saw some pretty colorful fish along the rocks in the shallow waters of several bays. If your resort is located near Ka’anapali, then you could check out Black Rock beach and Napili beach. If you’re staying near Waimea, then Coral Gardens might be your best bet to admire Maui’s underwater world. Once the kids get the hang of it, you could consider joining an organized tour to the State Marine Life & Bird Conservation District at the Molokini Crater. Most tours leave from the Lahaina harbour. There’s no cooler place for a first surf lesson than Hawaii. West Maui is known to offer excellent conditions for beginners with quiet waters. Still, for children that aren’t strong swimmers like our girls, there’s alway the boogie board. Whatever your style, board fun guaranteed in Maui for kids. North Pacific Humpback whales migrate to the safe and warm ocean waters of Maui yearly from November/December to May. A whale-watching cruise will give you a chance to see these friendly giants up close. Several large pods of spinner dolphins call these same waters home too so you might end up getting quite the show. Explore the underwater world with the Atlantis Submarine which dives about 100 feet in the ocean. A short boat ride takes you to the submarine which can seat 48 people. The list of family-friendly watersports Maui is endless: You could go SUP-ing, canoeing, kayaking… And little girls will be thrilled to hear that even Mermaid adventures await in Maui. The Haleakala is Maui’s main, dormant, volcano, forming over 75% of the island. Sunrise at the summit, with an elevation of 10,023 feet (3,055 m) is renowned but you need to make advance reservations via this link. But sunrise also means getting out of bed very early to get from your resort to the summit. A more family-friendly option is to watch the sunset at the Haleakala summit, no advance booking required. It will be so much more relaxing. And if the kids are comfortable enough (you can make it extra cozy by bringing plenty of blankets, cuddles… it’s cold up there) then you can stay longer and stargaze too. It’s one of the most epic things to do in Maui with kids if you play your cards right. 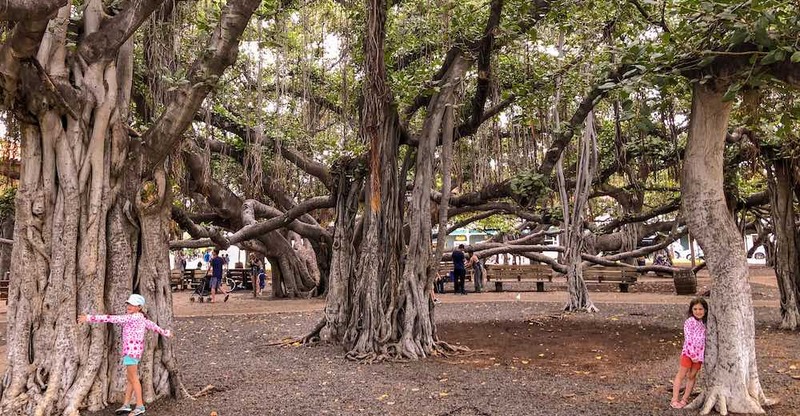 In the heart of the historical Lahaina, a magical sight awaits: the largest banyan tree of the United States. The tree, which was planted in 1873, is over 60 feet high (about 18 m), its crown is 225 feet wide (about 70 m). It looks as if it’s more than one tree but the aerial roots actually formed 16 new trunks that act as a support for the ever-growing tree. This leads to the tree not only growing vertically but just as much horizontally. Isn’t it incredible that what you see on this picture is actually just a small part of the banyan tree? Take a stroll down the streets of Lahaina, once the capital of the Hawaiian Kingdom. The Lahaina Historic trail is a self-guided walk along 62 historic Lahaina sites which takes about 1 hour to complete. Just head to the Lahaina Visitor Center in the Old Lahaina Courthouse, right next to the banyan tree, to find out more. You could have lunch right here in Lahaina but we have a better suggestion. Check out the next stop on our list of things to do in Maui with kids. Maui Tropical Plantation sits in the lush Waikapu Valley and is a great place to spend an hour or two. Indulge in the freshest treats at the Farms Stand or in restaurant The Mill. Oh, and let’s not forget the delicious ice-cream from The Scoop. 🙂 See, that’s why we prefer this spot for lunch over Lahaina. It’s a wonderful place to spend some time. The girls loved exploring the grounds and spot flowers and fruits. Pineapple, mango, papaya, macadamia nut, starfruit and avocado are just some of the deliciousness you can find on the plantation (depending on the season). Take the Tropical Express Tram Tour takes visitors on a 45-minute tour through the plantation. There’s usually only one stop and that’s where you’ll see a coconut opening demonstration. Download the free app and explore the plantation on a self guided walking tour. Every flower and animal you encounter are explained in the app. Have another ice-cream before you go, you’re on vacation, remember? When in 2001 Ali’i Chang received lavender from a friend, she used it to create the 13.5-acre Kula Lavender Farm in upcountry Maui. Wander through the 55 000 lavender plants during a guided walking tour, opt for the cart tour, the picnic lunch or the treasure hunt. This is definitely the most fragrant of things to do with kids in Maui. If you travel with two little girls, like we do, there’s no escape: lei-making will be one of your things to do in Maui with kids. Most resorts offer the possibility to participate in a lei-making class, sometimes for a small fee. Since the oil on the skin affects the flowers, a fresh flower lei is only good for one-time use. Keep it in the fridge during the day and wear it with pride at night. 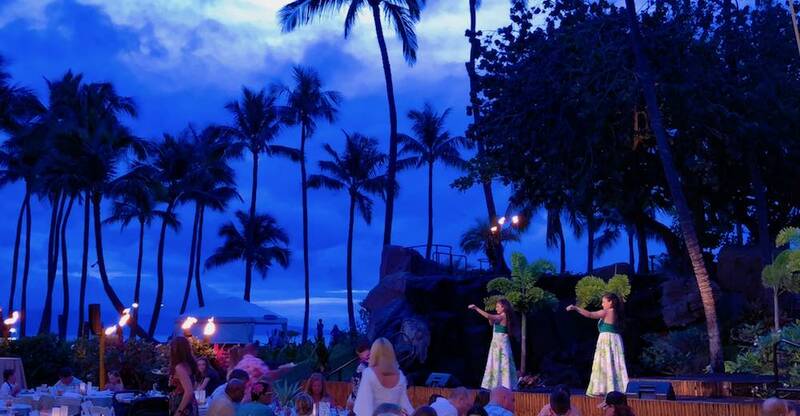 Attending a Maui luau is one of the most memorable things to do in Maui with kids. The tropical setting, the exotic music and the exquisite food all contribute to the magical atmosphere. The Wailele Polynesian Lu’au in the Westin Maui is one of the most celebrated ones on the island. 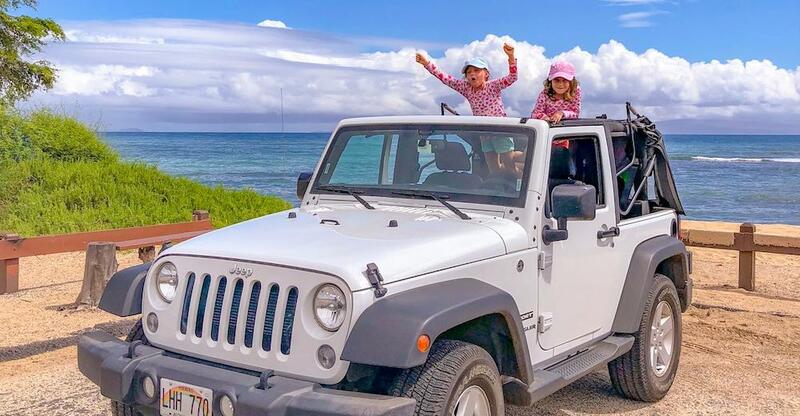 What a great experience to share as a family and the perfect ending for your Maui day trip. Not cultural in the classical sense, I know, but shave’ ice has somehow become part of a Hawaiian family vacation. Ululani’s Shaved Ice in Lahaina is an institution on the island and they even have matcha flavor, which I love! This map shows all family activities in Maui mentioned in this article. Feel free to use build on it when you’re planning your family trip. Most Maui family resorts are located in West Maui and South Maui. We’ve dedicated an entire article on the best places to stay in Maui to help you pick your favorite resort. We opted for the Westin Maui Resort & Spa, mainly because of the swimming pool with slides. The kids loved it! If you’re like us, you prefer exploring a region on your own. In that case, you need a car. You might have one available during your entire Maui vacation or rent one for the purpose of this Maui day trip. Either way, don’t rent just any car but make it a special one to set the mood. You’re in Maui, after all! 🙂 We picked up our Jeep Wrangler from Kapalua airport, which is often closer to the main resorts than Kahului airport. We used Discount Hawaii Car Rental for all of our car rentals in Hawaii: It offers the best rates and doesn’t even require an advance payment. What are your favorite Maui family activities? Have you been to the Valley Isle before? Then tell us all about your top things to do in Maui with kids or your favorite Maui day trip. Please do! We would love an excuse for a second Hawaii island hopping adventure. Pinning one of these images would be much appreciated! Disclosure: This article contains affiliate links. For more information, visit the Disclaimer page. Liked this article? Spread the love! I'm CosmopoliMom. With this family travel blog I want to inspire other families to travel with kids. As a polyglot who appreciates the finer things in life, I travel with all senses: hearing the language, tasting the food, observing local customs... There's nothing I like more than getting lost in unknown cities with the rest of the CosmopoliClan by my side. This sounds like a great fun filled day! Never been to a luau but I’m guessing it must’ve been mesmerizing! The variety of landscapes will keep kids interested all day long. The luau was indeed spectacular and comes highly recommended. Hope you get the chance to attend one soon! Thanks for passing by, Arnold!